As toucanBox is not like any other company, their gift cards are not like any other gift cards. They do get delivered to the door of your favourite little artist, but the delivery contains a little surprise to delight and engage from the very beginning. 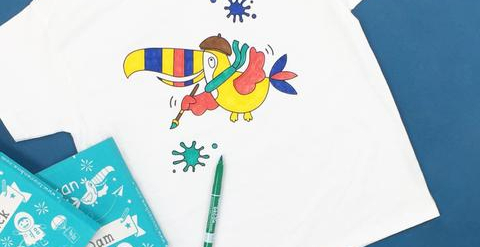 The gift cards are presented as part of a FREE welcome pack which contains a white 100% cotton t-shirt with a printed toucan bird to colour-in, a set of colouring pens, and instruction manual how to get crafting. a sticker sheet (because toucanBox know how much kids love them and thought they could pack just a little more excitement their boxes). Finally, you can opt for the extra gift-wrap and personal message service for a minimal extra charge. And you will also get an e-gift certificate containing the gift code emailed to you so that you can forward or hand-deliver it. Purchasing the gift card does not automatically begin the subscription. The gift code will need to be activated by the recipient for the subscription to begin.